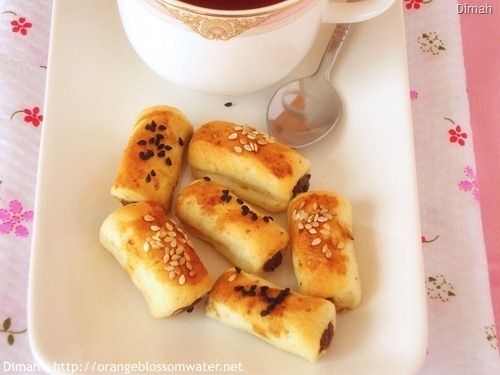 Asabe’e At-Tamr means date fingers, these are perfect with a hot cup of tea or coffee. 1, 2. In large bowl, combine flour, instant yeast, baking powder, sugar, salt, ground mahlab, pastries seasoning (read notes), and corn oil. 3, 4. Gradually add lukewarm water, and mix until dough is formed and knead very well. Cover and allow the dough to rise for 1 1/2 hours. 5, 6, 7, 8. Cut date paste and mix it with butter, pastries seasoning (read notes), and ground cardamom. Knead until all the ingredients combined. 9, 10. After 1 1/2 hours, dust the surface with flour (if needed), and roll out the dough to about 0.1 inch (0.2 cm) thickness. 11, 12. Roll out the filling with your palm into long ropes, the thickness is approximately similar to a pencil. 13, 14, 15, 16. Roll the edge of the dough over the filling. 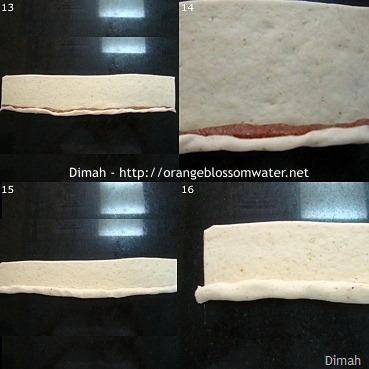 You should roll the dough over the filling for two times as in the pictures, first roll it as pictures (13, 14), then do it again as pictures (15, 16). 17, 18. 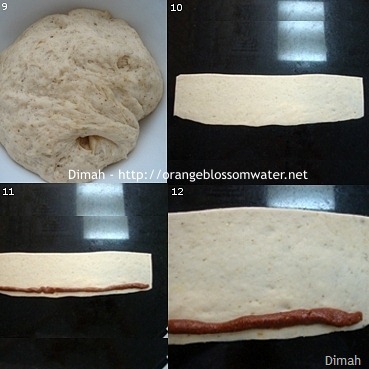 These pictures show you how the dough looks after rolling it twice. 19, 20. Cut extra dough using pizza cutter. 21, 22. After cutting extra dough, you will get the log only. 23. Cut the log into small rolls each equals to 1.6 inch (4 cm) long. 24. Place the rolls on a greased baking sheet (grease with corn oil). 25. Brush the rolls with date molasses. 26. Sprinkle with sesame seeds or Nigella seeds. Repeat all the process until you have used up all your dough. 27. Heat the oven, turn on the oven upper burner “broiler” on low temperature, and turn on the bottom burner “bake function” at 356°F (180 °C) (I’ve done this step of heating oven 15 minutes before placing the baking sheet in oven to cook), place the baking sheet in the oven (rack position the first from bottom), and bake for 8 – 10 minutes or until golden brown in color. 28. Remove from baking sheet, allow to cool and serve. In large bowl, combine flour, instant yeast, baking powder, sugar, salt, ground mahlab, pastries seasoning (read notes), and corn oil. Gradually add lukewarm water, and mix until dough is formed and knead very well. Cover and allow the dough to rise for 1 1/2 hours. Cut date paste and mix it with butter, pastries seasoning (read notes), and ground cardamom. Knead until all the ingredients combined. After 1 1/2 hours, dust the surface with flour (if needed), and roll out the dough to about 0.1 inch (0.2 cm) thickness. Roll out the filling with your palm into long ropes, the thickness is approximately similar to a pencil. Roll the edge of the dough over the filling. 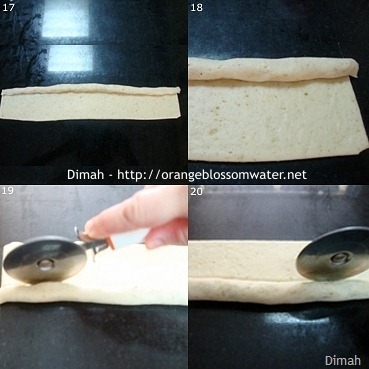 You should roll the dough over the filling for two times as in the pictures, first roll it as pictures (13, 14), then do it again as pictures (15, 16). 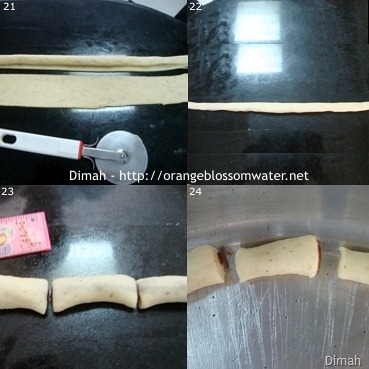 These pictures show you how the dough looks after rolling it twice. Cut extra dough using pizza cutter. After cutting extra dough, you will get the log only. Cut the log into small rolls each equals to 1.6 inch (4 cm) long. Place the rolls on a greased baking sheet (grease with corn oil). Sprinkle with sesame seeds or Nigella seeds. Repeat all the process until you have used up all your dough. Heat the oven, turn on the oven upper burner “broiler” on low temperature, and turn on the bottom burner “bake function” at 356°F (180 °C) (I’ve done this step of heating oven 15 minutes before placing the baking sheet in oven to cook), place the baking sheet in the oven (rack position the first from bottom), and bake for 8 – 10 minutes or until golden brown in color. Remove from baking sheet, allow to cool and serve. Please notice that I suggested two doughs and called them (Dough I) and (Dough II), you can choose one of them to make the recipe. Do not mix the ingredients of (Dough I) with (Dough II). Choose one dough only, and follow the directions of making the dough as explained. If you read the ingredients of (Dough I) and (Dough II), you can notice there is no big difference between them but the texture at the end differs. The fingers from first dough are slightly crispy, the second dough gives soft fingers. 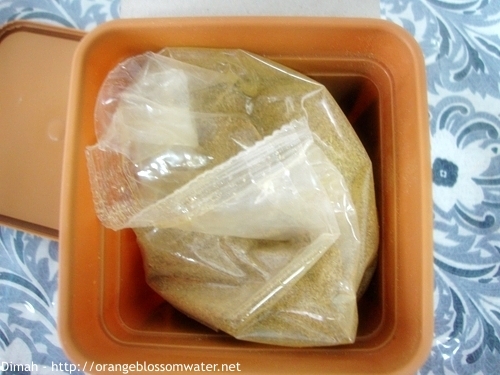 When you make any dough (from any recipe, not only this recipe), always keep in your mind that sometimes you may need extra water or extra flour or vice versa, and this happens due to many factors – it could be the method you used to measure the flour, so follow the recipe and adjust it if needed. 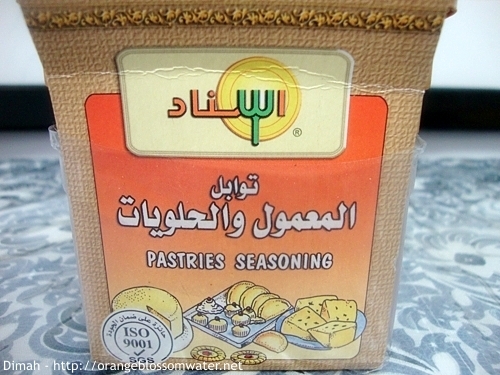 “Pastries seasoning” is known in Arabic as “Ma’amoul seasoning“. 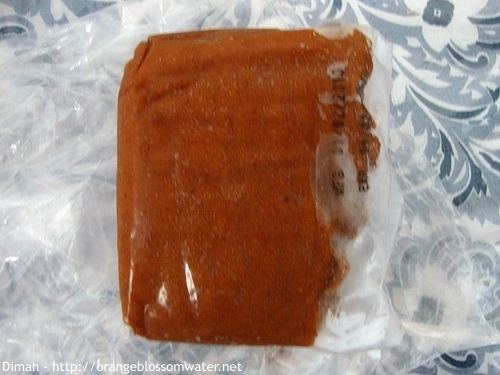 I bought it from Mecca – Saudi Arabia, the brand is “Esnad”, it is a mixture of (fennel, aniseed, mahlab, cinnamon, ginger, sugar and yeast), look at these pictures here and here. You can omit it. The amount of filling is enough for one dough only, if you want to make (dough I) and (dough II), so double the filling. 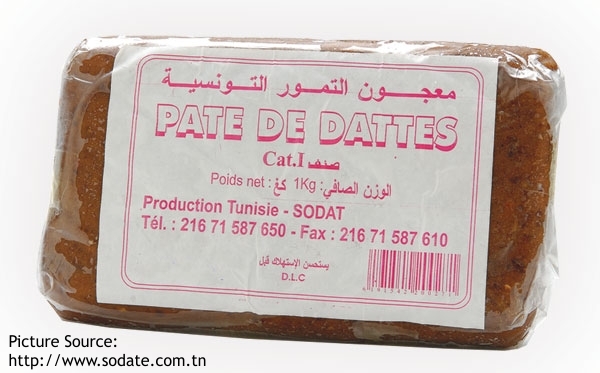 Date paste is available in the markets as a block, look here, here and here. 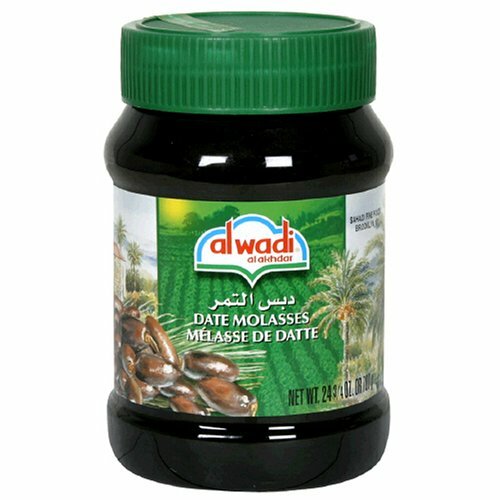 Here is a photo of Date Molasses, I used another brand. If you like you can brush the fingers with egg wash, but I don’t like the smell of eggs so I prefer to use date molasses which gives a nice color without the smell. If you feel that the molasses is too thick, so thin it with some water then use it to brush the fingers, mine didn’t need any water and used it without thinning. I used Aluminum baking sheet. 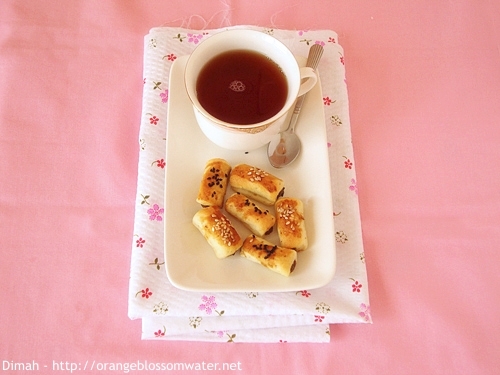 This entry was posted on Saturday, January 8th, 2011 at 1:43 PM	and is filed under Arabic Baking and Desserts. You can follow any responses to this entry through the RSS 2.0 feed. You can skip to the end and leave a response. Pinging is currently not allowed. Yummy, perfect with a cup of tea. These date fingers would be gobbled up in no time at my house! When I buy them at the Palestinian grocer, I always feel bad because they are not that fresh and when homemade taste a million times better. Thanks Dimah for giving me the motivation to try making my own for a change! Good Morning Dimah! We recently had a man at our Farmer’s Market come in with a date stand… I didn’t know what to do with them though. I’m off to the market today and you have inspired me to pick some up! Oh that is amazing recipe, and it looks fantastic! 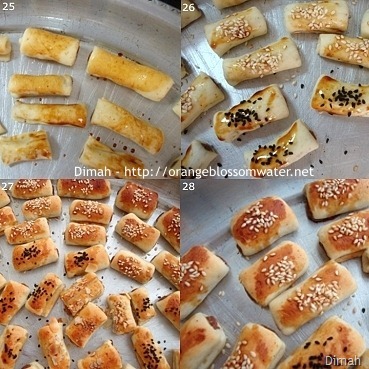 These rolls look wonderful Dimah..Date is one of my fav.Happy New Year to you and your family! 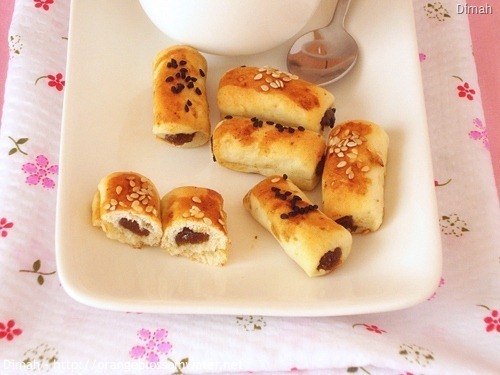 These yeast sweets with date filling look totally delicious! Dimah! So nice to see you again. I’ve missed you! Beautiful post as always. Lovely food, dainty presentation. Always like a big exhale to pop by your blog for ‘tea’! What a delightful recipe. These are so cute. The date filling looks so tasty. Mmmm, another delicious Syrian treat that I’d love to try! Thanks for this very interesting posts. So much for me to learn on spices. I was very interested in the Nigella seeds. We grow the plant a lot here, it is very pretty but I didn’t appreciate the use of the seeds until I read your blog. Plus I love dates of course and pastry! Lovely pasties for tea time. Beautiful pictures…love it. Even though there are many ingredients, the recipe looks easy. I love dates in pastries. What a wonderful treat! It looks similar to what my grandmother used to make for me! And I adore at-tamr! For me this is a delightful and unusual recipe for date fingers. I don’t think I have ever had them using yeast dough. The good news is that do have some mahlab and pomegranate molasses (not easy to find here in MExico) so I can try them. Thanks, Dimah! 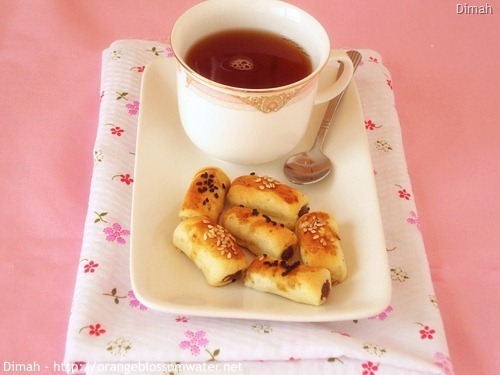 It’s so nice that you always have wonderful homemade snack items around! 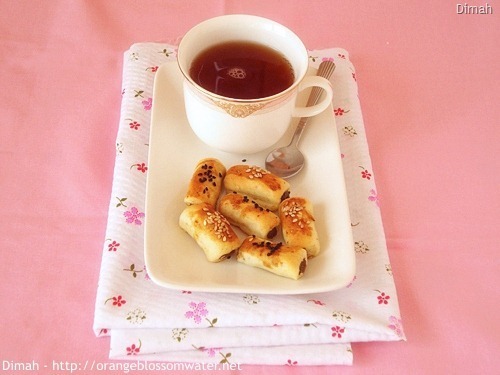 A wonderful treat with tea! I love mahlab, and always welcome recipes with it. Never heard of date molasses before, I wonder if I can find it here. Date molasses, not pomegranate…now there is an ingredient I must track down! Looks delicious as always. I love dates home made pastry is always best compared to store bought one. Hi, Dimah! Happy to know you are back. Date fingers looks delicious & I never had this before but your click tempting me to do it..
At first glance they look like mini sausage rolls. What a pleasant surprise that they are date fingers! What scrumptious little treats these are for having with a cup of tea! Thank you for including all the tips for us to make our own! Mmmhhh, those are fabulous! I love Mahleb. These are beautiful, I love any pastry using dates but yours looks perfect and tasty. Amazing clicks as usual…. U totally rock Dimah ! Kudos to your labour of love !! 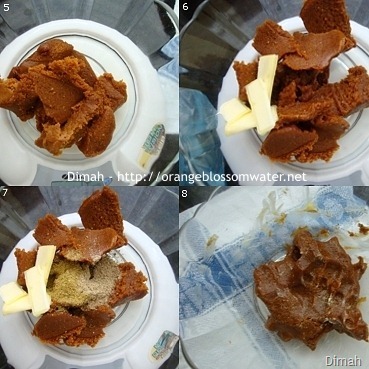 Welcome back Dimah… this recipe looks delicious and should taste even better… The result is great!! First I love mahlab or as we call it in Greece mahlepi. It gives such a beautiful flavor to the dough. 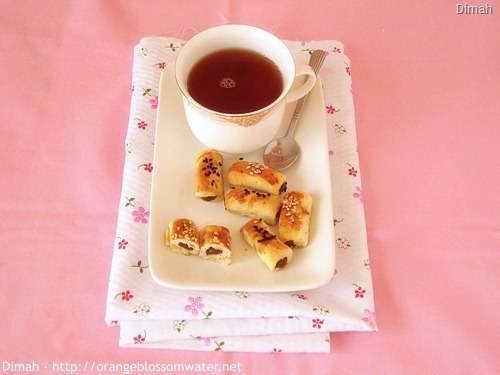 These little treats look so perfect to accompany a cup of tea or coffee. Oh they really do look perfect to have with coffee! Lovely … I am sure tastes great: I will try this out! your fingers sound so delicious and very well explained as usual. The photos are simply perfect. I love dates . . . and I love these dainties. Into my saved box they go! Everything you do is so pretty in pink! stunning date fingers! Best wishes for a great 2011 by Giorgia & Cyril! Welcome back! 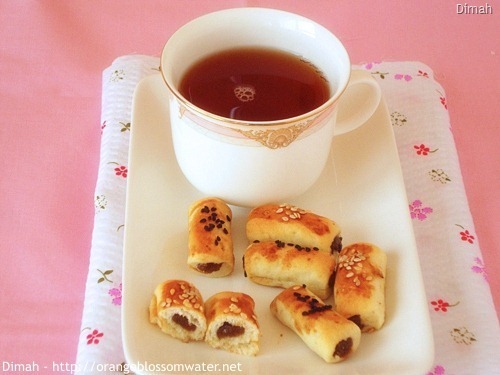 These date fingers sound simply delicious and a must have with any hot beverage. Thanks for sharing. Is there truly something called “pastry seasonings?” This is so beautiful, Dimah – little rich nuggets that beg to be eaten. And enjoyed. Dimah, your data fingers look so tempting and addictive!! Amazing pictures for these delicious mahlab! They are perfect and so pretty! These date fingers look like a tasty treat! What delicious little morsels and what a delightful first photo! These look wonderfully delicious! A great way to use dates. Congrats on top9! Welcome back! What a beautiful recipe. I love dates. I bet these are absolutely amazing with a cup of tea. Congrats on making number 1 on the foodbuzz today!!! These look delicious! I wouldn’t have thought to put nigella seeds on this. What perfect timing to find your post–I just brought back a lot of dates from a trip to Dubai and was thinking about what to do with them, other than eat them as is :-). Thank you so much for all the photos and the links and explanations of ingredients that are not necessarily familiar to me in the U.S., mahlab being one. Congratulations on your 1st place in Foodbuzz’s top 9! Such pretty styling! I’m so glad I found your blog. I have tried cooking a lot of middle eastern savoury dishes and love them, maybe it’s time I moved on to sweet things, now!! Love the recipe. Congrats on Top 9 over at foodbuzz!! I was just thinking about making some date cookies. These look delightful! lovely! i always buy these at the middle eastern grocery store because my husband loves them (he grew up in the middle east). I will try this recipe out! Gorgeous date fingers, Dimah. I grew up, like I’m sure you did too, consuming lots of dates. It was my candy as a kid. Oh my! This looks delectable. I can imagine wrapping this with pineapple jam and we have a variant of the famous pineapple tart! Dimah, congratulations on your Top 9! I am very happy for you. I always love your finger food and no more excuse not to make them. By the way, the dough sounds like some kind of bread dough. Is the texture more or less like bread? And you actually used yeast on it! Very interesting! Well, it will be hard to get the date paste here. I hope there will be something intereseting to replace it. LOl! :o) Probably, pineapple jam! Yeah, right! yay… I try my best to get the ingredients for the dough part too! Wish me luck! Hope you’re having a terrific day. 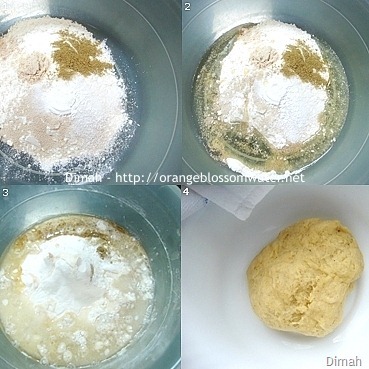 Dimah, there are 2 pastry dough recipes here. Should I make both or just either one? Thanks! Btw, I am following your blog long ago but I have no idea why the update doesn’t showed up! EEErrrrr….Really frustrating! this looks so pretty and elegant.. i really love the flavor combo in here as well.. thank you for sharing this. as usual you have an amazing way of describing the recipes- simply superb! tasteofbeirut: Thank you! hope you try them! fooddreamer: Thank you so much! Pauline: Many thanks for stopping by and for the lovely comment! Mateja: Thank you so much for visiting! Saras: Thank you so much for the lovely comment! rebecca: Thank you! Happy New Year to you and your family! leaf (the indolent cook): Thank you so much! Raina: Thank you so much for the kind comment! Reeni: Thank you for visiting! Rosa: Thank you! Happy New Year to you and your family! Junia @ Mis Pensamientos: Thanks for visiting! Priya Sreeram: Thank you so much, dear! Unpizzicodime: Thank you so much for stopping by! A little bit of everything: Thank you so much! Happy New Year to you and your family! Rosemary @ Sprigs of Rosemary: Thank you so much for visiting! OysterCulture: Thank you so much! Claudia: Thank you so much! it is famous in the gulf and they use it for ma’moul. Sweet Artichoke: Thank you so much! Peggy: Thanks for stopping by! Emma @ sunflower days: Thank you! Chelsea @ sprinklesofparsley.com: Thanks for visiting! Natalie: Thank you so much for stopping by! Nadia: Thank you so much! Nisrine | Dinners & Dreams: Thank you so much! Kimba’s Kitchen: Thanks so much! Shirley@kokken69: Thank you so much! Oh my gosh. I haven’t seen this since we lived in Lebanon some 30 years ago. I loved them then. I’ll have to make them and take them to my parents. They’ll be shocked. Thank you! These are so very cute! And I love that they are the perfect shape for dunking! I can’t believe I hadn’t heard about those date fingers earlier. They look so delicious!! Hi..thanks for visiting my blog else I would have not come across your lovely blog containing so many of your traditional cuisines. Now I will get to know about syrian delicacies. This looks great Dimah! And welcome back. Also congrats on top 9! Asabe At-tamr looks very delicious,I’m absolutely going to try it! I just adore dates. Would love to have some of these and that pretty cup of tea too! Thanks for the step by step photos… very helpful. Soumya: Thanks for stopping by! honeybeecooksjackfruit: Thank you so much for the kind comment! Thank u for stopping by my space. You have a lovely space here..